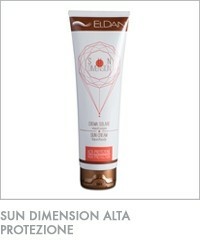 A soft sun cream formulated to offer high protection to very fair, delicate and sensitive skin. It helps to protect the skin and cell DNA with its hydrating, nourishing and soothing action. UVA and UVB filters work with ectoine, panthenol, and extracts of pomegranite and watermelon to protect the skin from damage from the sun and free radicals, leading to a lasting, uniform tan. It helps to protect the skin from photoaging. Easily absorbed, leaving the skin soft, hydrated and radiant. Panthenol, vitamin E, vitamin C, ectoin, pomegranate extract, UV filters, saccharide isomerate, watermelon extract, titanium dioxide. Who: for all skin types. How: apply to face and body generously and evenly before sun exposure; repeat application several times during the day, particularly after swimming or perspiration. Avoid lengthy exposure to the sun during the hottest hours of the day.